Want Great Christmas Party Ideas Brisbane… Hire A Magician! A close-up roving table Magician would be one of the best Christmas party ideas Brisbane that will give your guests the most fantastic and memorable time which will be remembered by staff, friends and family long after your Christmas party is over. Congratulations! You have stumbled across one of the best Christmas party ideas Brisbane, Magic Mike is Brisbane’s and Gold Coasts most successful close-up roving table Magicians. Are you having a Christmas party that requires an entertainer to ‘break the ice’ by performing close-up comedy magic that will have your guests laughing, interacting and amazed like never before? Sometimes when a group of people get together for the first time at a Christmas party can sometimes have a little hint of awkwardness with guests either starting conversation or interacting. To encourage guests to interact by breaking the ice using magic and comedy as the vehicle is a great way to start the party. A typical example of this is Mike approaches a group of people, does his performance then leaves the group who were previously quite are now interacting, laughing and talking to the others about how Mike did that trick. 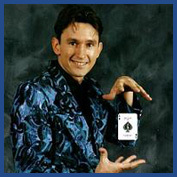 With 18 years of experience Magic Mike achieves all this with sleight of hand, timing, body language and humour. Christmas Party Ideas Brisbane utilizes several magical props to name a few: sponge balls, cards, silks even a hilarious fury Raccoon that runs around the place doing impersonations. To help make your Christmas party ideas Brisbane more fun Magic Mike’s routine is to borrow items from the guests things like rings, watches, money, cigarettes and other items. Disappearing and reappearing other peoples items adds another astonishing level of be wilderment to Magic Mikes routine for the obvious reason that the items are not gimmicked or a Magicians tool. Magic Mike’s close-up roving magic is a fantastic service that can ‘break the ice’ for all Christmas party ideas Brisbane to entertain your guests at your Wedding while you have your photo’s taken. Whatever the occasion Magic Mike the Magician can accommodate with whatever requirements you need. Would you like your guests to have this much fun at your Christmas Party Ideas Brisbane? Mike the Magician can do the same for you. Entertainment is an important ingredient for successful Christmas party ideas Brisbane. Christmas Party Ideas Brisbane is a great way to get your Christmas party started in a funny positive way. Christmas Party Ideas Brisbane encourages and stimulates communication between your guests to help break the ice. Enjoyable memories of your Christmas party will be talked about and remembered by your guests days after the party is over. Copyright © 2009 Magic Mike. All Rights Reserved. Magic Mike, P.O Box 366 , Helensvale, Qld 4212. Phone: 0414 658 075, Fax: 0755 108 478.